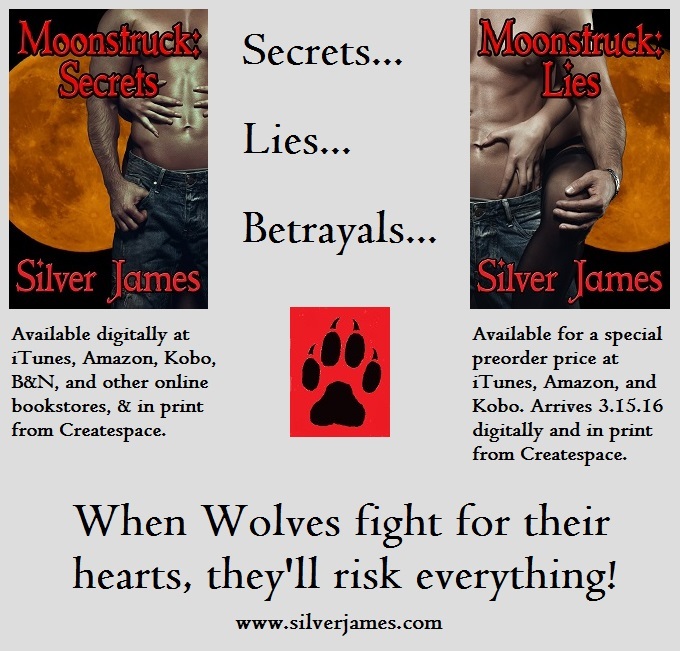 Don’t forget to pre-order MOONSTRUCK: LIES at the special price of $3.99. It will go up a week after it’s release date of March 15th! In order to keep numbering of volumes where they made sense, I created a “new” series with the compilation novels that are also going into print. That series is now MOONSTRUCK GENESIS, because they get deeper into the overall plot arc and world-building. Makes sense, right? So, here’s my dilemma. I have a new story (that’s been submitted to a publisher) that expands the Moonstruck-verse. I’ll self-publish if SMP doesn’t contract for it. Then there’s the KW story. How do I identify these tales with the Moonstruck world? How do I number them? I can’t really put them under the aegis of Genesis. I’ve come up with some ideas and I’d love to have your thoughts on them. They are listed in no particular order and I won’t tell you the one I’m leaning toward until people weigh in. Which is your favorite? Do you have any additional suggestions? And I hope you’re having a fun weekend! This entry was posted in Books, Writing Life and tagged books, business, characters, herding cats, inspiration, Moonstruck, Moonstruck: Lies, new release, Saturday, writing. Bookmark the permalink. I like Foundation, to me you will be taking this from the ground up and building! Damn girle-Iffy and You seem to be setting Muse Valley ablaze with ideas!